It's a Wonderful Life is a 1946 American drama film produced and directed by Frank Capra and loosely based on the short story "The Greatest Gift" written by Philip Van Doren Stern. The film takes place in the fictional town of Bedford Falls shortly after World War II and stars James Stewart as George Bailey, a man whose imminent suicide on Christmas Eve gains the attention of his guardian angel, Clarence Odbody (Henry Travers) who is sent to help him in his hour of need. Much of the film is told through flashbacks spanning George's entire life and narrated by Franklin and Joseph, unseen Angels who are preparing Clarence for his mission to save George. Through these flashbacks we see all the people whose lives have been touched by George and the difference he has made to the community in which he lives. The film is regarded as a classic and is a staple of Christmas television around the world, although, due to its high production costs and stiff competition at the box office, financially, it was considered a "flop." The film's break-even point was actually $6.3 million, approximately twice the production cost, a figure it never came close to achieving in its initial release. An appraisal in 2006 reported: "Although it was not the complete box-office failure that today everyone believes … it was a major disappointment and confirmed, at least to the studios, that Capra was no longer capable of turning out the populist features that made his films the must-see, money-making events they once were." It's a Wonderful Life was nominated for five Oscars without winning any, but the film has since been recognized by the American Film Institute as one of the 100 best American films ever made, and placed number one on their list of the most inspirational American films of all time. On Christmas Eve 1945, George Bailey (James Stewart) is deeply depressed, even suicidal. Prayers for George are heard by the angels. Clarence Odbody (Henry Travers), Angel Second Class, is assigned to save him—and thereby earn his wings. Joseph, the head angel, reviews George's life with Clarence. As a 12-year-old boy, George (Bobby Anderson) saved the life of his younger brother Harry (Todd Karns) after he fell through the ice on a pond, though George got an ear infection that impaired his hearing in one ear. Later, as an errand boy in a pharmacy, George saved his boss, druggist Mr. Gower (H.B. Warner), from mistakenly filling a child's prescription with poison while grief-stricken over the death of his son from influenza. From childhood, George's greatest ambition has been to see the world and design bridges and skyscrapers. However, he repeatedly sacrifices his dreams for the well-being of others. He puts off going to college to help in the family business until Harry graduates from high school and can replace him at the Bailey Building and Loan Association, vital to many of the poor. On Harry's graduation night in 1928, George discusses his future with Mary Hatch (Donna Reed), who has had a crush on him since she was a little girl. Uncle Billy (Thomas Mitchell) and Harry then break the news to George that his father has had a stroke. Mr. Potter (Lionel Barrymore), a heartless slumlord, seizes the opportunity to try to convince the board of directors to end the "sentimental hogwash" of providing home loans for the working poor. George persuades them to reject Potter's proposal, but they agree only on condition that George himself run the Building and Loan. He reluctantly stays in Bedford Falls and gives his school money to his brother. Harry goes to college, but George's hopes of leaving Bedford Falls upon his graduation are dashed once again when Harry unexpectedly brings home a wife. Her father has offered Harry a good job in his company. Although Harry is willing to turn it down, George cannot bring himself to ruin his brother's prospects. George and Mary eventually get married, but on their way out of town for their honeymoon, they witness a run on the bank that leaves the Building and Loan in danger of collapse. Potter offers George's clients "50 cents on the dollar," but George and Mary quell the panic by using the $2,000 earmarked for their honeymoon to give the townspeople what they need to tide them over. Later, Mary, with the aid of cab driver Ernie (Frank Faylen) and Bert the cop (Ward Bond), concocts an elaborate mock honeymoon in their new house. George starts up Bailey Park, an affordable housing project, with bar owner Martini and his family as the first homeowners. They and the other residents will no longer have to pay high rents to Potter. Potter tries to derail the competition by tempting George with a job at eight times his current salary, but George vehemently rejects the offer. Over the next several years, George and Mary raise a growing family. When World War II erupts, George is unable to enlist due to his bad ear. Harry becomes a fighter pilot and is awarded the Medal of Honor for shooting down 15 enemy aircraft, including two Japanese kamikaze aircraft trying to crash into a troop transport. On Christmas Eve, Uncle Billy encounters Mr. Potter and, bursting with pride, shows him the newspaper article about Harry, about to be honored by the President. Distracted, he misplaces $8,000 he was to deposit for the Building and Loan; Potter discovers it later in the newspaper and keeps it. That day, the bank examiner is to inspect the Building and Loan's records. When George's frantic search fails to uncover the money, in desperation, he appeals to Potter for a loan to save the company. Potter turns him down. George crashes his car into a tree during a snowstorm and runs to a nearby bridge to commit suicide, feeling he is "worth more dead than alive" because of a $15,000 life insurance policy. Before George can leap in, however, Clarence jumps in first. After a shocked George rescues him, Clarence reveals himself to be George's guardian angel and pleads to help him. George bitterly wishes he had never been born, so Clarence shows him what the town would have been like if he had never existed. Bedford Falls is called Pottersville and is mostly a slum, with Main Street dominated by pawn shops and sleazy bars. Bailey Park was never built. Mr. Gower was convicted of poisoning the child, spent years in prison, and is now an alcoholic reduced to panhandling. Martini no longer owns the bar. Ernie and Bert are much darker characters. Violet (Gloria Grahame) is a dancer who gets arrested as a pickpocket. Uncle Billy has been in an insane asylum for years, while Harry is dead, since George was not around to save him. Consequently, the men Harry would have saved in the war have also perished. His mother is a lonely, embittered widow running a boarding house, and Mary is a spinster librarian who wears glasses, her vision all the worse for the lack of marrying George. George begs Clarence and God to let him live again. His prayer is answered; he is returned to the moment he met Clarence. George runs home, filled with a new appreciation of what he has accomplished. He finds his friends and family have collected a huge amount of money to rescue him and the Building and Loan. The newly arrived Harry proposes a toast to his brother, "the richest man in town." Seeing how many lives he has touched, and the difference he has made to Bedford Falls (along with helping Clarence earn his wings), George Bailey realizes that, despite his problems, he "really has a wonderful life." The contention that James Stewart is often referred to as Capra's only choice to play George Bailey is disputed by film historian Stephen Cox, who indicates that "Henry Fonda was in the running." Although it was stated that Jean Arthur, Ann Dvorak and Ginger Rogers were all considered for the role of Mary before Donna Reed won the part, this list is also disputed by Cox as he indicates that Jean Arthur was first offered the part but had to turn it down for a prior commitment on Broadway before Capra turned to Olivia de Havilland, Martha Scott and Ann Dvorak. Ginger Rogers was not considered. Originally dubbed Herbert Potter, a long list of actors were considered for the pivotal role of Mr. Potter : Edward Arnold, Charles Bickford, Edgar Buchanan, Louis Calhern, Victor Jory, Raymond Massey, Vincent Price and even Thomas Mitchell. However, Lionel Barrymore, who eventually won the role, was a famous Ebenezer Scrooge in radio dramatizations of A Christmas Carol at the time, and the similarity of Scrooge to Mr. Potter is obvious, so it is likely that he was first choice for the role. The original story "The Greatest Gift" was written by Philip Van Doren Stern in November 1939. After being unsuccessful in getting the story published, he decided to make it into a Christmas card, and mailed 200 copies to family and friends in December 1943. The story came to the attention of RKO producer David Hempstead, who showed it to Cary Grant's Hollywood agent and, in April 1944, RKO Pictures bought the rights to the story for $10,000 hoping to turn the story into a vehicle for Grant. RKO created three unsatisfactory scripts before shelving the planned movie with Grant going on to make another Christmas picture, The Bishop's Wife. At the suggestion of RKO studio chief Charles Koerner, Frank Capra read "The Greatest Gift" and immediately saw its potential. RKO, anxious to unload the project, sold the rights in 1945 to Capra's production company, Liberty Films, which had a nine-film distribution agreement with RKO, for $10,000, and threw in the three scripts for free. Capra, along with writers Frances Goodrich and Albert Hackett—with Jo Swerling, Michael Wilson, and Dorothy Parker brought in to "polish" the script—turned the story and what was worth using from the three scripts into a screenplay that Capra would rename It's a Wonderful Life. The script underwent many revisions throughout pre-production and during filming. Seneca Falls, New York claims that when Frank Capra visited their town in 1945, he was inspired to model Bedford Falls after it. The town has an annual It's a Wonderful Life festival in December. In mid-2009, The Hotel Clarence opened in Seneca Falls, named for George Bailey's guardian angel who saves him from leaping to his death. It's a Wonderful Life was shot at the RKO studio in Culver City, California , and the RKO Ranch in Encino , where "Bedford Falls" was a set covering , assembled from three separate parts with a main street stretching 300 yards (three city blocks), with 75 stores and buildings, a tree-lined center parkway and 20 full grown oak trees. For months prior to principal photography, the mammoth set was populated by pigeons, cats and dogs in order to give the "town" a lived-in feel. Due to the requirement to film in an "alternate universe" setting as well as during different seasons, the set was extremely adaptable. RKO created "chemical snow" for the film in order to preclude the use of dubbed dialogue when actors walked across the earlier type of movie snow, made up of crushed cornflakes. Filming started on April 15, 1946 and ended on July 27, 1946, exactly on deadline for the 90-day principal photography schedule. The RKO ranch in Encino, the filming location of Bedford Falls, was razed in the mid-1950s. Because of this there are only two remaining locations from the film. The first is the swimming pool that was unveiled during the famous dance scene where George courts Mary. It is located in the gymnasium at Beverly Hills High School and is still in operation as of 2008. The second location is the "Martini home", at 4587 Viro Road in La Canada Flintridge , California. During filming, in the scene where Uncle Billy gets drunk at Harry and Ruth's engagement party, George points him in the right direction home. As the camera focuses on George, smiling at his uncle staggering away, a crash is heard in the distance and Uncle Billy yells, "I'm all right! I'm all right!" Equipment on the set had actually been accidentally knocked over — Capra left in Thomas Mitchell's impromptu ad lib. The full extent of Mr. Potter's deviousness is never revealed to the other characters in the film, and he is never brought to account for absconding with the $8,000, although Capra filmed an alternate ending that was subsequently cut wherein Uncle Billy remembers misplacing the money in the newspaper when he unties a string, and Potter receives a "comeuppance". A number of alternative endings were considered with Capra's first script having Bailey falling to his knees reciting The Lord's Prayer (the script also called for an opening scene with the townspeople in prayer). 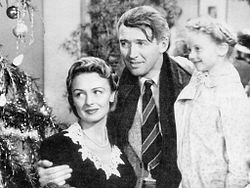 Recognizing that an overly religious tone did not have the emotional impact of the family and friends rushing to rescue George Bailey, the closing scenes were rewritten. It's a Wonderful Life premiered at the Globe Theatre in New York on December 20, 1946 to mixed reviews. While Capra considered the contemporary critical reviews to be either universally negative or at best dismissive, Time magazine said, "It's a Wonderful Life is a pretty wonderful movie. It has only one formidable rival (Goldwyn's The Best Years of Our Lives) as Hollywood's best picture of the year. Director Capra's inventiveness, humor and affection for human beings keep it glowing with life and excitement." Bosley Crowther, writing for The New York Times, complimented some of the actors, including Stewart and Reed, but concluded that "the weakness of this picture, from this reviewer's point of view, is the sentimentality of it—its illusory concept of life. Mr. Capra's nice people are charming, his small town is a quite beguiling place and his pattern for solving problems is most optimistic and facile. But somehow they all resemble theatrical attitudes rather than average realities." One motion picture industry source reported to the FBI in 1947 that the movie resembled Communist propaganda in its making a banker the most despised person in the story. The film, which went into general release on January 7, 1947, placed 26th in box office revenues for 1947 (out of more than 400 features released), one place ahead of another Christmas movie, Miracle on 34th Street. In 2002, Britain's Channel 4 ranked It's a Wonderful Life as the seventh greatest film ever made in its poll "The 100 Greatest Films" and in 2006, the film reached #37 in the same channel's "100 Greatest Family Films". It currently ranks 30th on the IMDb's top 250. A more iconoclastic viewpoint was expressed by Wendell Jamieson in a 2008 New York Times article, which posited that the film "is a terrifying, asphyxiating story about growing up and relinquishing your dreams, of seeing your father driven to the grave before his time, of living among bitter, small-minded people. It is a story of being trapped, of compromising, of watching others move ahead and away, of becoming so filled with rage that you verbally abuse your children, their teacher and your oppressively perfect wife." The film's elevation to the status of a much-beloved classic came decades after its initial release, when it became a television staple in the 1970s and 1980s Christmas seasons. This came as a welcome surprise to Frank Capra and others involved with it. "It's the damnedest thing I've ever seen," Capra told the Wall Street Journal in 1984. "The film has a life of its own now and I can look at it like I had nothing to do with it. I'm like a parent whose kid grows up to be president. I'm proud… but it's the kid who did the work. I didn't even think of it as a Christmas story when I first ran across it. I just liked the idea." In a 1946 interview, Capra described the film's theme as "the individual's belief in himself," and that he made it to "combat a modern trend toward atheism." Prior to the Los Angeles release of It's a Wonderful Life, Liberty Films mounted an extensive promotional campaign which included a daily advertisement highlighting one of the film's players, along with comments from reviewers. Jimmy Starr wrote, "If I were an Oscar, I'd elope with It's a Wonderful Life lock, stock and barrel on the night of the Academy Awards". The New York Daily Times also wrote an editorial in which it declared the film and James Stewart's performance, to be worthy of Academy Award consideration. The Best Years of Our Lives, a gritty and topical drama about servicemen attempting to return to their pre-World War II lives, won most of the awards that year, including four of the five for which It's a Wonderful Life was nominated. (The award for "Best Sound Recording" was won by The Jolson Story.) The Best Years of Our Lives was also an outstanding commercial success, ultimately becoming the highest grossing film of the decade, in contrast to the more modest box office returns of It's a Wonderful Life. Capra won the "Best Motion Picture Director" award from the Golden Globes, and a "CEC Award" from the Cinema Writers Circle in Spain, for Mejor Película Extranjera (Best Foreign Film). Jimmy Hawkins won a "Former Child Star Lifetime Achievement Award" from the Young Artist Awards in 1994; the award recognized his role as Tommy Bailey as igniting his career which lasted until the mid-1960s. Liberty Films was purchased by Paramount Pictures, and remained a subsidiary until 1951. In 1955, M. & A. Alexander purchased the movie. This included key rights to the original television syndication, the original nitrate film elements, the music score, and the film rights to the story on which the film is based, "The Greatest Gift". National Telefilm Associates (NTA) took over the rights to the film soon thereafter. However, a clerical error at NTA prevented the copyright from being renewed properly in 1974. Despite the lapsed copyright, television stations that aired it still were required to pay royalties. Although the film's images had entered the public domain, the film's story was still protected by virtue of it being a derivative work of the published story "The Greatest Gift", whose copyright was properly renewed by Philip Van Doren Stern in 1971. The film became a perennial holiday favorite in the 1980s, possibly due to its repeated showings each holiday season on hundreds of local television stations. It was mentioned during the deliberations on the Copyright Term Extension Act of 1998. In 1993, Republic Pictures, which was the successor to NTA, relied on the 1990 U.S. Supreme Court ruling in Stewart v. Abend (which involved another Stewart film, Rear Window) to enforce its claim to the copyright. While the film's copyright had not been renewed, the plaintiffs were able to argue its status as a derivative work of a work still under copyright. It's a Wonderful Life is no longer shown as often on television as it was before enforcement of that derivative copyright. NBC is currently licensed to show the film on U.S. network television, and traditionally shows it twice during the holidays, with one showing on Christmas Eve. Paramount (via parent company Viacom's 1998 acquisition of Republic's then-parent, Spelling Entertainment) once again has ancillary rights for the first time since 1955, while NBC's broadcast rights are licensed from Trifecta Entertainment & Media (which holds television distribution of the Republic/Paramount theatrical library). Due to all the above actions, this is one of the few RKO films not controlled by Turner Entertainment/Warner Bros. in the USA. Director Frank Capra met with Wilson Markle about having Colorization, Inc. colorize It's a Wonderful Life based on an enthusiastistic response to the colorization of Topper from actor Cary Grant. The company's art director Brian Holmes prepared 10 minutes of colorized footage from It's a Wonderful Life for Capra to view, which resulted in Capra signing a contract with Colorization, Inc., and his "enthusiastic agree[ment] to pay half the $260,000 cost of colorizing the movie and to share any profits" and giving "preliminary approval to making similar color versions of two of his other black and white films, Meet John Doe (1941) and Lady for a Day (1933)". However, the film was believed to be in the public domain at the time, and as a result Markle and Holmes responded by returning Capra's initial investment, eliminating his financial participation, and refusing outright to allow the director to exercise artistic control over the colorization of his films, leading Capra to join in the campaign against the process. Three colorized versions have been produced. The first was released by Hal Roach Studios in 1986. The second was authorized and produced by the film's permanent owner, Republic Pictures, in 1989, with better results. Both Capra and Stewart took a critical stand on the colorized editions. The initial colorized versions of the film have been withdrawn, and the only version shown on TV is the original black-and-white version. In 1993, due in part to the confusion of the ownership and copyright issues, Kinesoft Development, with the support of Republic Pictures, released It's a Wonderful Life as the one of the first commercial feature-length films on CD-ROM for the Windows PC (Windows 3.1). Predating commercial DVDs by several years, it included such features as the ability to follow along with the complete shooting script as the film was playing. Among the companies that released the film on home video before Republic Pictures stepped in were Meda Video (which would later become Media Home Entertainment), Kartes Video Communications (under its Video Film Classics label), GoodTimes Home Video, and Video Treasures (now Anchor Bay Entertainment). After Republic, Artisan Entertainment (under license from Republic) took over home video rights in the mid-1990s. Artisan was later sold to Lions Gate Entertainment, which continued to hold US home video rights until late 2005 when they reverted to Paramount, who also owns video rights throughout Region 4 (Latin America and Australia), and in France. Video rights in the rest of the world are held by different companies; for example, the UK rights are with Universal Studios. The movie has seen multiple DVD releases since the availability of the DVD format. In the fall of 2001, Republic issued the movie twice, once in August, and again with different packaging in September of that same year. On October 31, 2006, Paramount released a "60th Anniversary Edition". On November 13, 2007, Paramount released a two-disc "special edition" DVD of the film that contained both the original theatrical black-and-white version, newly restored, and a new, third colorized version, produced by Legend Films using the latest colorization technology. On November 3, 2009, Paramount released a DVD version with a "Collector's Edition Ornament", and a Blu-Ray edition. The film was twice adapted for radio in 1947, first on Lux Radio Theater (March 10) and then on The Screen Guild Theater (December 29), then again on the Screen Guild Theater broadcast of March 15, 1951. James Stewart and Donna Reed reprised their roles for all three radio productions. Stewart also starred in the May 8, 1949 adaptation presented on the Screen Director's Playhouse. The film was remade for television in 1977 as It Happened One Christmas starring Marlo Thomas and Wayne Rogers, with Thomas as the protagonist. A musical stage adaptation of the film, titled A Wonderful Life, was written by Sheldon Harnick and Joe Raposo. This version was first performed at the University of Michigan in 1986, but a planned professional production was stalled by legal wrangling with the estate of Philip Van Doren Stern. It was eventually performed in Washington, DC by Arena Stage in 1991, and had revivals in the 21st century, including a staged concert version in New York City in 2005 and several productions by regional theatres. It's a Wonderful Life has been popularized in modern cultural references in many of the mainstream media. Due to the proliferation of these references, only a few examples will suffice to illustrate the film's impact. The Sesame Street Muppets characters Bert and Ernie share their names with the cop and the taxicab driver in the film. Longtime Muppets writer and puppeteer Jerry Juhl said he believed there was no connection and that this was a coincidence. The Capra-esque episode Elmo Saves Christmas (1996), which featured a clip from the film, pokes fun at the persistent reports of a connection, having them look at each other in disbelief as George calls Bert and Ernie by name. In the Broadway musical Rent, the film is referenced by character Roger Davis, who tells Benny that he "can't wipe out an entire tent city, then watch 'It's a Wonderful Life' on TV." In the Broadway musical In the Heights, the character Usnavi references the film in the song "Finale" with the line, "It's a wonderful life that I've known/Merry Christmas you old building and Loan!" A 12th-season episode of Saturday Night Live showed the "fabled lost ending" of It's a Wonderful Life, where George (played by Dana Carvey) physically assaults Mr. Potter (Jon Lovitz) after discovering that Potter kept the $8,000 that Uncle Billy misplaced, and has faked his disability all those years, declaring "I don't want the money, I want a piece of you! [...] you're nothin' but a scurvy little spider!" George is joined in beating Potter by Uncle Billy (Phil Hartman) and Harry (Dennis Miller). Film historian and reviewer James Berardinelli elaborated on the parallels between this film and the classic Dickens tale A Christmas Carol. In both stories, a man revisits his life and potential death (or non-existence) with the help of supernatural agents, in the end experiencing a joyous epiphany and a renewed view of his life. Blockbuster MediaRoom: It's a Wonderful Life. Blockbuster Inc. Retrieved: June 2, 2007. Ervin, Kathleen A. Some Kind of Wonderful. Failure Magazine (n.d.). Retrieved: June 2, 2007. Cox 2003, pp. 29–31. Note: It was not a true "Christmas card" but rather, a 24-page pamphlet. "Tempest in Hollywood." New York Times April 23, 1944, p. X3. Weems, Eric. Frank Capra online. Retrieved: June 2, 2007. Note: The project went through many hands including Howard Hughes who reportedly was interested. Capra 1971, p. 376. Note: Capra claims the script was purchased for $50,000.00. Goodrich et al. 1986, pp. 135, 200. McDonald, Joan Barone. "Seneca Falls: It’s a ‘Wonderful’ town." The Buffalo News, November 16, 2008. Retrieved: December 29, 2008. Wayne, Gary. "Hollywood on Location: the '40s." seeing-stars.com. Retrieved: August 25, 2009. Dirks. Tim. "Review." filmsite.org. Retrieved: August 25, 2009. Jones, Robert L. "Review." objectivistcenter.org. Retrieved: August 25, 2009. Time, New Picture, December 23, 1946 Retrieved: June 8, 2007. Crowther, Bosley. "'It's a Wonderful Life', Screen in Review." The New York Times, December 23, 1946. Retrieved: June 8, 2007. Chen, Will. "FBI considered 'It's A Wonderful Life' Communist Propaganda". Living Large on a Small Budget, December 24, 2006. Retrieved: June 8, 2007. Note: Despite how Chen characterizes the contents of FBI memo, the FBI analyst does not take a stance on the question, only reporting without comment what his industry source claimed. American Film Institute Catalog of Motion Pictures (online database). "AFI Crowns Top 10 Films in 10 Classic Genres." American Film Institute, ComingSoon.net, June 17, 2008. Retrieved: June 18, 2008. "Top 10 Fantasy." American Film Institute Retrieved: June 18, 2008. Jamieson, Wendell. "Wonderful? Sorry, George, It's a Pitiful, Dreadful Life." The New York Times, December 18, 2008. Retrieved: December 20, 2008. Wiley and Bona 1987, p. 163. Capra's re-editing of the original score by Dimitri Tiomkin was restored to the Tiomkin version by Willard Carroll in the 1980s and released on a CD in 1988. Cox 2003, pp. 12–14. U.S. Copyright Office, Catalog of Copyright Entries, New Series, Renewals sections in the 1973–1974 volumes. Renewal Registrations, p. 1614, Catalog of Copyright Entries, January–June 1971. U.S. Copyright Office. The United States copyright of "The Greatest Gift" will expire in 2038, 95 years after its publication. The Copyright Term Extension Act of 1995: Hearing Before the Committee on the Judiciary, United States Senate, One Hundred Fourth Congress, first session, on S. 483 ... September 20, 1995. By United States. Congress. Senate. Committee on the Judiciary, United States. Published by U.S. G.P.O., 1997, pp. 16, 73, 126. ISBN 978-0160543517. Alsdorf, Matt. Slate.com: "Why Wonderful Life Comes but Once a Year." slate.com, December 21, 1999. Retrieved: September 10, 2009. Edgerton, Gary R. "The Germans Wore Gray, You Wore Blue." Journal of Popular Film and Television, Winter 2000. Retrieved: October 5, 2007. "It's a Wonderful Life" Chicago Sun-Times, January 1, 1999. Retrieved: February 24, 2008. Burr, Ty. "ABC'S OF CD: Delivering the Future." ew.com, Entertainment Weekly, 2009. Retrieved: May 29, 2009. Note: Voyager Company's Hard Day's Night, released in May 1993, slightly predated the Kinesoft product. It was originally advertised as an Audio CD. "Peter Sills: Developer BIO." mobygames.com, 2009. Retrieved: May 29, 2009. Carroll, Jon. "A Few Tiny Errors." The San Francisco Chronicle January 3, 2000. Saturday Night Live - It's a Wonderful Life Lost Ending Retrieved: December 21, 2008. Finler, Joel W. The Hollywood Story: Everything You Always Wanted to Know About the American Movie Business But Didn't Know Where to Look. London: Pyramid Books, 1988. ISBN 1-855-10009-6. Willian, Michael. The Essential It's a Wonderful Life: A Scene-by-Scene Guide to the Classic Film, 2nd ed. Chicago: Chicago Review Press, 2006. ISBN 978-1556526367. Cox, Stephen. "On a Wing and a Prayer", Los Angeles Times, December 23, 2006, p. E-1.